It's not really the time of year you would think to make baked apples, but that's me, always going against the grain :) Actually the reason I decided to make them is because my mom gave me a bunch of granny smith apples because she knows I eat a lot of fruit. I tried eating them raw just as a snack, but they were a bit too acidic, which is weird because they usually don't bother me. So I figured I would make a quick snack by stuffing and baking them. My inspiration for the recipe comes from Mary Ann Esposito of Ciao Italia. Her recipe uses some different ingredients, such as walnuts and apricots, but the technique is basically the same. I watch her every week and she always cooks up something worth trying. And her recipes are usually so simple and quick to prepare. This recipe is no exception. I whipped these up at 9:00pm one night when I had the hankering for something sweet. The prep is so easy it took just minutes, so I got them ready, popped them in the oven, continued watching a movie and I was already eating them before ten. Plus, the house smelled so delicious before bedtime, perfect for "sweet dreams". The best part about these apples was the stuffing... All those warm and chewy bits of fig and the delicious cranberries that give a bit of a punch! And my favorite... the toasted pecans! I think I would try anything if there were pecans in it. Add the figs and cranberries to a small saucepan of boiling water and cook for about 5 minutes until softened. Drain, cut the stems off the figs and discard. Chop up the figs into small pieces and place them and the cranberries in a bowl with the peacans. Add the honey and mix well. Divide the mixture in half and stuff it in the cored apples. Place the apples in a baking dish; add the water and orange zest to the bottom of the dish. Bake for 25 to 35 minutes or until the apples are just soft but not collapsed. Serve warm with some of the pan juices. Note: This recipe can be doubled very easily... go for it! I bet these are delicious any time of year! 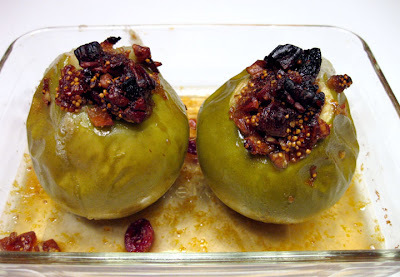 Mmm, these baked apples look totally delicious! I love a baked apple any time of the year. That filling looks amazing. I may have to get some apples so I can have these too! These look and sound delicious! I would make these in the fall or winter but a fruit based dessert is lovely in the spring and summer when you're looking for something a little lighter! My parents are huge Maryann fans and have bought me a couple of her books. Now I have to check to see if I have this one. Wow! What a fabulous combo of my favorite ingredients! These look delicious! I have teeny tiny little apples on my tree, but they'll be ready in a few months and I'm sure I'll make this. What luscious baked apples! A great idea! Wow, very nice...love figs...looks amazing. Would love to try it! Nice pictures! 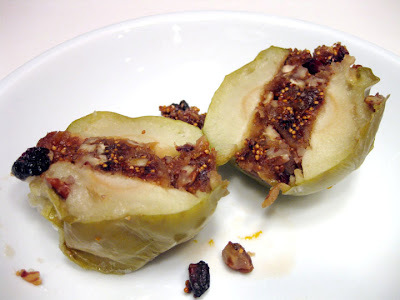 i love baked apples..but stuffed with figs and cranberries? must be awesome! I agree about the pecans! And I was just thinking something with apples sounded good. I love, love this idea. I swear we think alike! I do the same thing with pretzels and peanut butter by the way. 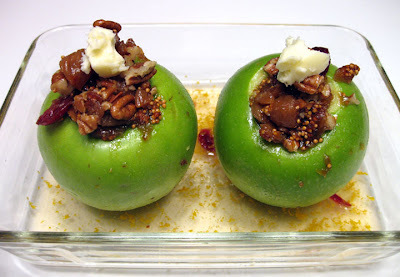 Great idea for using Granny Smith apples. I love the thought of mixing the figs and cranberries as well.